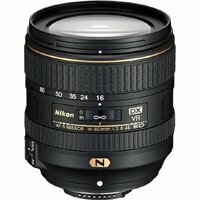 Perfect for travel, the Nikon 16-80mm f2.8-4E AF-S VR ED lens is a DX compatible wide-angle zoom with bright f/2.8-4 aperture throughout the entire zoom range, making it suitable for a wide range of photographic subjects, including landscapes, portraiture, street and everyday snapshots. The lens incorporates Nano Crystal Coating to minimise ghosting and a new electromagnetic diaphragm mechanism, which enables stable auto-exposure control - a first for a Nikon DX-format lens. The Nikon 16-80mm is ideal for shooters looking for a lightweight, ultra-compact lens to maximise their potential.